**This is a sponsored post written by myself on behalf of Savings.com and Sam's Club. Post contains affiliate links. All thoughts are 100% my own. As a military wife, I know a little something about moving. During his days of active duty, we always knew that a move could happen at any time anytime. And while I'll admit I would sometimes look forward to the fresh start and having a new house to decorate--- the actual moving process? That was something I could do without. Still, I did learn a few tips along the way and today I'm sharing them with you! Clear It Out Before You Go. Moving is a great time to clear out the excess--- save your time and sanity by clearing out anything you don't want or need rather than packing and piling it all into your new home. Give yourself a fresh, clutter free start. Pack By Room. Pack each room separately and label boxes clearly so that it's easier to get them where they belong once you get to the new location. If possible, I also suggest packing the essentials you'll need right away into your own vehicle should their be any delay with the moving truck. Save the Kids' Rooms For Last. When we move, I have a pretty specific order that works for us. First I pack books, decor, etc... things we don't need to use before moving day. I've found that in our home, the kids can often get a little upset when their things start going away--- so they are always the last to be packed and the first to be settled. Don't Forget To Change Your Address. As a blogger, I get a lot of mail so this is a big one. We all might remember to complete a change of address through the post office... but that's not the only place we'll want to change it--- any online shopping we frequent, subscriptions, even Paypal. Check the Basics. When we move into the new house, we don't think to check things like the smoke alarm batteries or air filters. We assume they are ready for us when we move in, but that's not always the case. What better way to kick off our new home than by making sure everything is new and ready? When it comes to stocking up on new home essentials, Sam's Club is the perfect choice. Not only can you stock your pantry and cleaning closet right off the bat, but on those every day new home basics like 3M Filtrete air filters! In addition to the saving with the low prices available to Sam's Club members, by making sure that your air filter is new and knowing exactly when they're due to be changed, you can keep your furnace running more efficiently, saving you money on utilities. Speaking of saving, 3M Filtrete filters are $8 off now through November 25th with Sam’s Club Instant Savings. Visit here to learn more about this great deal. Not yet a member? Sign up for your membership to take advantage of this great offer today. Ready to stock up on home essentials? Would $100 Sam's Club gift card help? 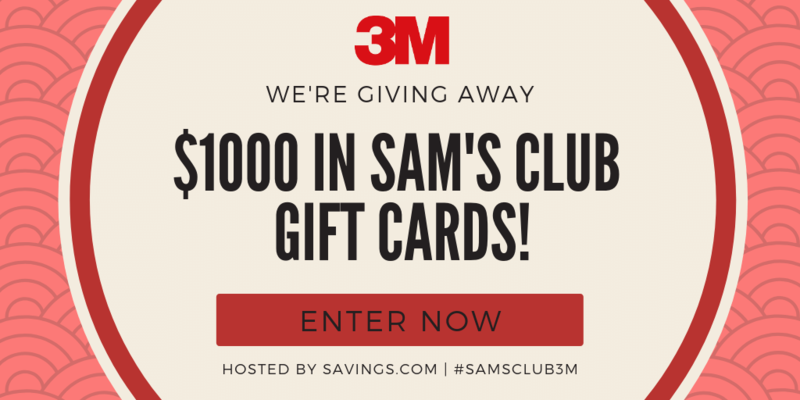 Be sure to enter to win one of ten $100 Sam’s Club gift cards being given away by Savings.com. Monday, November 12th at 12:00 AM ET to Friday, November 16th at 11:59 PM ET. Users enter the giveaway by heading to the Sam's Club page on Savings.com and submitting their email address on the form at the top of the page.